SILICON SLOPES, Utah – March 22, 2016 – Today at Domopalooza, Domo unleashed the world’s first Business Cloud. The Business Cloud gives you all the data, all the people and all the insights needed to run your entire business and make faster, better decisions to improve business performance. Through an ecosystem of business management apps, the Business Cloud can be personalized by any employee in any company. These new apps are a mix of free and premium pre-packaged solutions that are easy to discover and use, enabling decision makers to find answers to business questions specific to their role or industry. The Business Cloud is also available for free to any user; users pay to store more data or access more advanced enterprise functionality such as administrative controls. 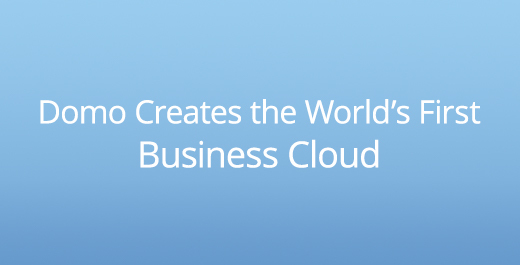 Today Domo announced the Domo Appstore and the availability of 1,000 new Domo Apps. Just as apps deliver the real value to the iPhone and to devices like Apple TV, Domo Apps are the future of managing your business. Regardless of department –finance, IT, marketing, sales, operations or all of the above – figuring out ROI and business impact from investments across the organization has become way too complicated and requires drastic simplification. Domo Apps address these challenges. Given the success of developers already creating third-party apps, and to support the growth of the Domo Appstore, Domo also announced today the Domo App Publisher Partner Program. The App Publisher Partner Program includes tools, best practices and support for developers building apps for the Business Cloud. With this news, Domo has made available its APIs and SDK, making it easy for anyone to build custom apps for their own business or for their customers’, and contribute solutions to the Domo Appstore. The program launched with more than a dozen partners on board. For partners, the sophistication and ubiquity of Domo’s platform for connecting to and preparing data eliminates some of the most complex components of software development. As a result, partners can easily bring apps to market and compete more aggressively with larger solution providers. To back compelling companies making a major commitment to building the Business Cloud ecosystem, Domo also announced a $50 million investment fund. Teaming with Domo on this investment program are leading venture capital firms GGV Capital, IVP and Zetta Venture Partners. Domo today announced Buzz, an entirely new online collaboration platform that leverages the social fabric of your organization to speed business insights and drive better decision making. Buzz has been three years in development and is integrated into the Domo platform. It is available to every employee in every organization for free, not just available for paid Domo users. With features such as real-time chat, threaded conversations, social profiles, org charts, a company directory and task management, Buzz provides social context around business discussions. These new features give users more than just conversations around the data, they also allow a better understanding about the people who are providing the insights. Key features that other solutions charge for, such as user and team administration and unlimited search history, are free with Buzz. Also several years in the making, Domo today announced Domo Mobile, a new experience that brings the power of the Business Cloud to any device. As part of the Business Cloud, Domo Mobile brings together technologies never before combined in enterprise software to deliver a social network experience to users around their business data. With Domo Mobile, users can easily see what metrics are most important to others in the organization, what conversations are trending, look up people in their organization – and keep track of the business metrics that are most important to them for managing their business. Domo Mobile functionality includes live data exploration, real-time collaboration, trending org views, projects, tasks and an active company directory. Domo Mobile is delivered via Mobile Web and new native Android and iOS apps. Today, Domo also kicked off an initiative to improve how data is leveraged for business gain. Domo announced the Standards for APIs Tour this Spring to bring together key stakeholders across the country to address critical issues around improving API quality. More information can be found at StandardsforAPIs.org. Over the past twenty years, there has been massive success in the cloud industry with software innovation that has brought deep functionality to departmental groups across businesses of all sizes. However, despite this incredible revolution in enterprise software, there has never been an easy way to get data from all the clouds, plus the rich repository of on premise data a business has collected, to work together. As a result, the process of trying to leverage business data for business gain has gotten too complex, too costly and too time consuming, leaving decision makers at a loss when it comes to having a real time, holistic understanding of their business. The Business Cloud leverages thousands of data sources and sophisticated technology Domo has developed to bring that data seamlessly together. It then layers on a highly consumerized user experience through apps, social and mobile capabilities, and the power of an ecosystem to forever change the way business is managed.